From the moment you become engaged, there are announcements to be made and invitations to be sent for various functions. Having one place to find everything you need each step of the way until your big day makes things easier for you. An online web site such as eInvite allows you to browse for all of your wedding essentials from the comfort of home. When you use the web site, you can personalize all of your cards and invitations while being confident your information is safe and secure. Using the online system to preview your order, you can rest assured it will arrive just as you created it. A dove colored ring pillow for your ring bearer to carry your rings to the altar makes an ideal keepsake of your special day. You can personalize the pillow with your names on the satin pillow. A white ribbon is tied around the cushion so you can tie your rings in place. The ring holder has a design of Mr. and Mrs. and it is just one of the lovely designs found on eInvite. You will find a wide selection of engagement announcements as well as save the date cards to let everyone know the happy news of your engagement. Colors vary and designs include this elegant announcement with a lace border in celery. Beautiful scrolling adorns one corner of the card. 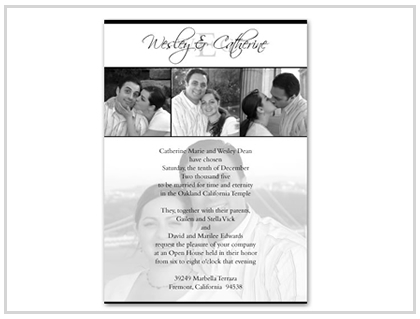 The dark grey color makes an ideal background for your announcement and complements the border. One of the many designs for bridal shower invitations is this simple and charming light teal blue card. Turtledoves hold the delicate straps of a white wedding gown in the center of the card. The cards are 5×7 inches in size and come with crisp white envelopes. You can personalize the card with your details easily on the web site. The selection of rehearsal dinner cards range from simple to elegant. A variety of colors is available including browns, pink, sage, and purples. This simple design features goblets above the raised text. Premium crafted white paper is used and you choose the ink color you desire for your details. For out of town guests, direction and accommodation cards are a nice touch. Simple cream directions cards enclosed with the wedding invitation will help your guests find you. The raised black text looks elegant against the cream background. The design complements any type of invitation they are enclosed with. Place cards tell guests which table they will be seated at for the reception dinner. eInvite has a wide selection of place cards from plain and simple to more elaborate designs. This elegant paisley design card adds charm to the table. The folded design stands up next to the dinner plate with the name of the guest and table number. The guest book makes a sentimental reminder of those who shared your special day. The buttercream fabric covering this guest book features raw silk finish. The cultured design provides a lovely place for guests to sign their names. Ink colors include burnished gold for your personalization on the cover. Wedding favors are popular items many couples use as small tokens of appreciation for their guests sharing their marriage celebration with them. Favor boxes are small square boxes that hold mementos for wedding guests. This stylish black favor box is personalized with initials and floral scrolling. They make a nice remembrance for your guests to take home. A wedding program allows guests to follow along as well as letting them know who is in the wedding party. This simple scroll program has an understated elegance. The black ink stands out on the white background. The designs of programs range from simple to formal and the card colors range from white to blues and greens. The designs and styles of wedding invitations available cover a wide range from modern to seasonal. Pocket invitations, wraps, and all in one are more options that are available. 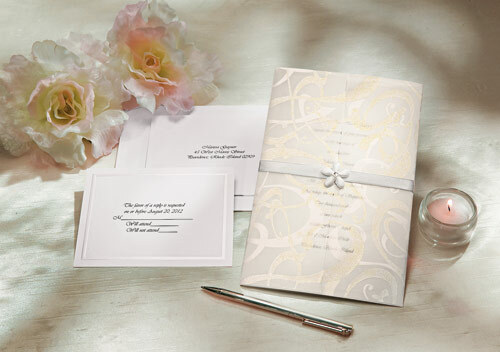 A traditional invitation is still a popular choice among brides. This vertical invitation features layered cream paper with a matching cream ribbon. They include cream envelopes and complimentary tissues for each invitation.